A Michigan Department of Natural Resources conservation officer returning from snowmobile patrol in Alger County heard the call from Delta County dispatch and unloaded his snowmobile at Hunter’s Point on the Stonington Peninsula. Hunter’s Point has a boating launch site on the Stonington Peninsula side of the bay. Hartsig found the boy walking on the ice with no shoes about a mile from shore. Hartsig said the boy was scared and complained that his feet hurt. The temperature was in the teens and winds on the bay were 25 to 30 mph. The DNR officer took off the boy’s wet socks, warmed his feet and gave the child his boots, jacket and helmet. He sat the boy in front of him on the snowmobile and the two sped across the ice to the Michigan State Police post near the shore in Gladstone. There, the boy’s mother, a Delta County sheriff’s deputy and an ambulance were waiting. The incident was reported at about 4 p.m. The boy, whose name was not being released, had run away from the Log Cabin Grill and Bar, which is situated south of Gladstone, along Lake Michigan. To reach the lake, the boy had cross four busy lanes of traffic on U.S.-2. His mother last saw him heading east across the ice. Sgt. Jerrold Fitzgibbon with the DNR says it could have ended very poorly. He credited Hartsig’s response to turning around a bad situation before it got worse. “This could easily have ended poorly for the boy had Pat not been there and located him as quickly as he did,” said Fitzgibbon, who oversees conservation officers, including Hartsig, in Alger, Delta and Schoolcraft counties. Hartsig was hired by the DNR about two years ago. He has patrolled Delta County since. He is originally from Romeo, located in Macomb County. Learn more about Michigan DNR conservation officers online by visiting www.michigan.gov/conservationofficers. 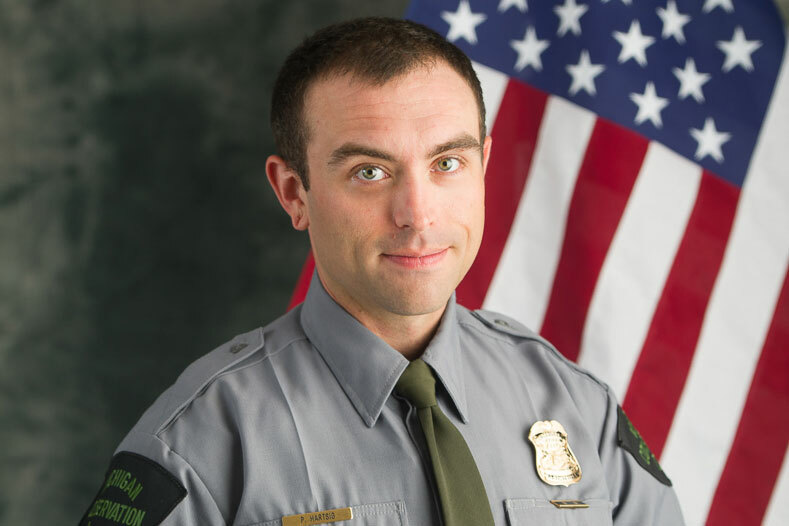 Share the post "DNR officer rescues runaway boy from ice on Little Bay de Noc"